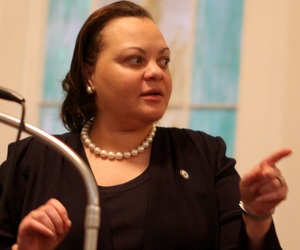 State Sen. Karen Carter Peterson, shown during a March meeting in the Irish Channel, delivered a feisty rebuttal to Gov. Bobby Jindal's speech Monday -- via her Twitter account. In the ever-accelerating world of political journalism, it’s increasingly common for pundits and media figures to offer their reporting live over the Internet as events unfold. Likewise, it’s a well-established tradition that after any head of state gives a major address, members of the opposing party are sought out afterward for a response.